West Brom moved to within four points of the Championship automatic promotion spots as Dwight Gayle's strike saw them beat Stoke 1-0 at the bet365 Stadium. The goal came from their only shot on target in the first half; Ahmed Hegazi's brilliant first-time cross found the striker in the six-yard box and he headed home his 16th of the season (25). Potters midfielder Peter Etebo had the best chances for the hosts, but their laboured build-up proved to be their downfall as they found it difficult to test the reactions of goalkeeper Sam Johnstone. Victory sees West Brom occupy fourth after completing a first league double over Stoke outside the top-flight since the 1930/31 season, while Nathan Jones' difficult start to life in charge of Stoke continues; his side have now lost five of his first six games. The fixture marked Jones' first month in charge of the Potters, but as the Welshman has highlighted already, the turnaround will not be instant. In spite of that, the fans' audible frustrations grew throughout the game. 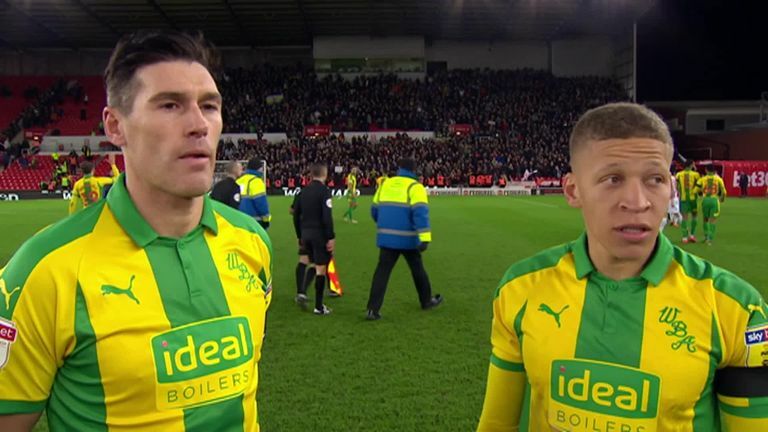 Gareth Barry says it is a welcome clean sheet for West Brom following their 1-0 win against Stoke, while Dwight Gayle agreed the three points was vital. Though Stoke were the masters of their own downfall, the Baggies first came in stylish fashion. Stefan Johansen's free-kick found the unmarked Ahmed Hegazi, whose first-time cross was nodded over the line by Dwight Gayle. Having been the first side to draw blood, West Brom managed the game well and were, on numerous occasions, afforded the time to re-group and crowd the box when the Potters looked to create something. Before the break, however, they were denied a penalty when Gareth Barry seemingly handled a cross, though his body shape suggested he had misjudged the trajectory of the ball as he attempted a headed clearance. 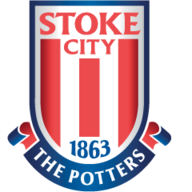 Stoke boss Nathan Jones made two changes to his side as he marked a month in charge of the Potters; Tom Ince and Ryan Woods returned in place of Ashley Williams and Bojan. 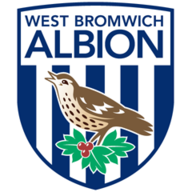 Just Jake Livermore and Jay Rodriguez retained their starting spots for the Baggies, following the fourth round replay defeat to Brighton in midweek. January loan signings Jacob Murphy and Stefan Johansen were handed their first starts for the club. Sam Vokes was kept in check by the robust backline and missed the chance to apply the finishing touch to Tom Edwards' teasing low cross, while Tom Ince wasted a glorious chance to level the game when he blazed a free-kick over the bar from 20 yards. He was replaced by Ryan Shawcross in stoppage time as Jones looked to add further muscle to his frontline, but West Brom ensured the hosts saw out the game on the backfoot as they recorded a valuable victory. 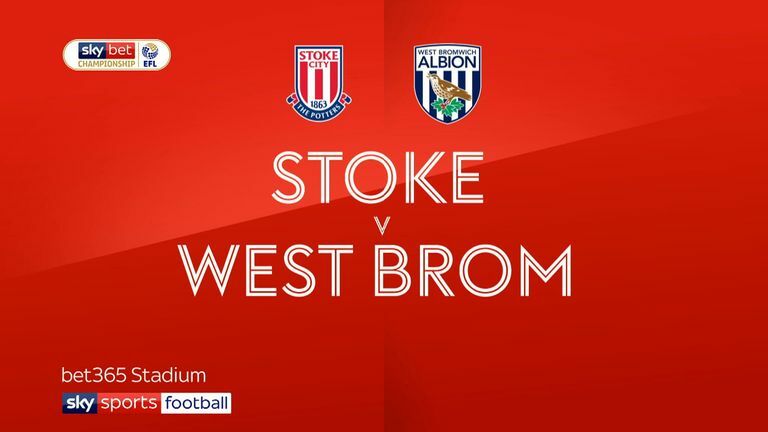 Stoke may have offered little threat in attack against West Brom, but Barry - one of the most experienced players in the division - marshalled Darren Moore's troops well and kept the Potters' opportunities to a minimum. Nathan Jones: "I thought, to be honest with you, it was a real good football match. Two slightly different shapes going at each other; the margins were tiny. We switched off in the first half, they went again process, tried to do their own thing and that's what's cost us, ultimately. 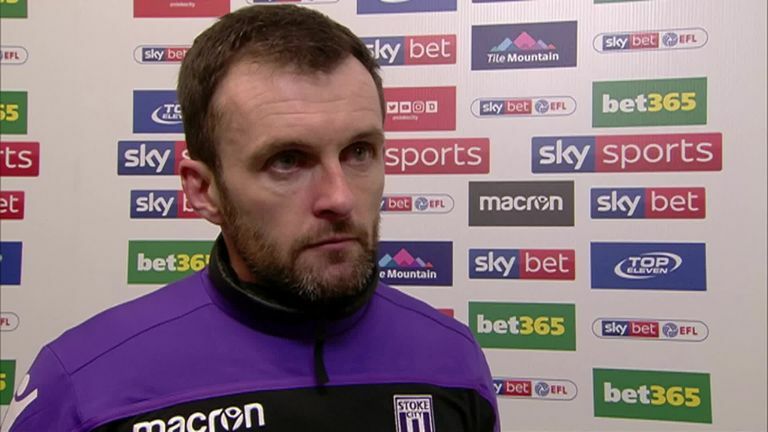 Nathan Jones says despite Stoke's 1-0 defeat to West Brom, he is taking plenty of positives from the game. "I thought we moved the ball really well, it was pretty even, I thought we probably edged it and then we just lacked a little bit of cutting edge. I've got to be honest, that's a positive performance for me." Darren Moore: "We showed a bit of resilience with the ball as a group, as a team. They put us under pressure tonight and I just thought my players out there really positioned themselves well to deal with it. 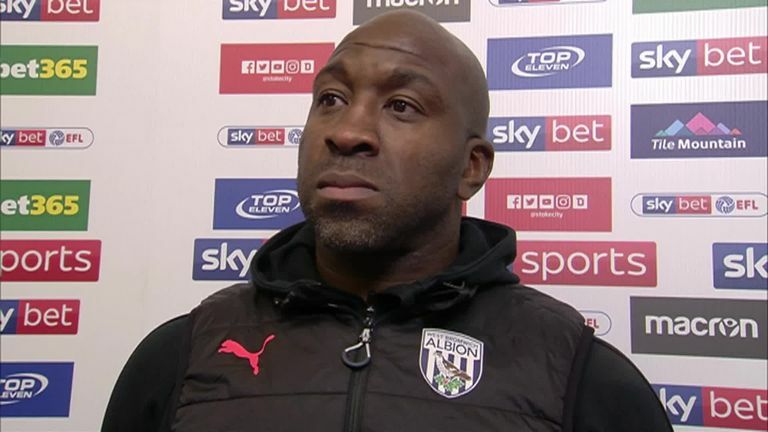 Darren Moore says he is proud of the entire team following West Brom's 1-0 win against Stoke and praised their resilience against a good side. "It's a difficult, difficult place [to come]. I can clearly see what Nathan's doing with them - they are getting better, they are a different team than they were three weeks ago and it takes time. We're really pleased because that was a tough game tonight." West Brom host Nottingham Forest on Tuesday evening, in a game which is live on Sky Sports Football, while Stoke travel to Wigan the following day. That game is also available on Sky Sports Football via the red button.